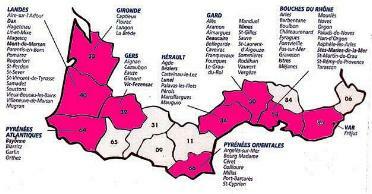 In Southern France there are 5 bullfighting schools. From 5-6 years old the children begin to attend these schools with their parents permission. They begin to learn how to torture and kill animals. It is difficult to imagine the carnage at these practise sessions due to the inexperience of the children. Once again the authorities subsidise these “schools” with tax payers money. A disgusting show opening with a parade of bullfighters (dressed in traditional torturers outfits) presenting themselves to the audience to the sound of music. Forcibly expelled from the pen("toril")to an unknown environment without possiblity of escape, the bull is defenceless. Several men taunt him with capes. Their objective is to mislead or confuse the bull in order to tire him. The "picador" then enters the ring, riding a horse wearing a protective padded cape. The picador has an instument called a "puya", a kind of long spear, terminating in a triangular pyramid of iron, that cuts like a razor. From the back of the horse, the picador stabs the bull with the puya, aiming particularly at the neck muscles in order to weaken the animal and to prevent him from raising his head. The bull tries to defend himself, but cannot reach the picador, only the horse. Despite the protective padding, the horse is frequently severely wounded. To control the horse's terror, his eyes are blindfolded, his ears are plugged, and he is sedated. After this appear the "toreros"(bullfighters), each armed with 2 "banderillas"(a kind of stick covered with colourful papers and the tip of which is a kind of harpoon 5-7 cm in length). Several pairs of banderillas are stuck in the bull. The animal due to his suffering struggles in vain to get rid of them, but every movement just increases his pain. After the stabbing by the banderillas, the matador (bullkiller) enters to continue the carnage. He repeatedly stabs the bull with a sword to kill him, since it's rare that the animal is killed by the first stab. If the bull does not die, another instrument is used, a kind of small sword (called "descabello"). The bull is then stabbed with this several times near the first cervical vetebrae. The bull is then dragged out the bullring by an sort of carriage drawn by two horses. Sometimes the bull is still alive and when he arrives to the slaughter house of the bullring - he is butchered while still alive. 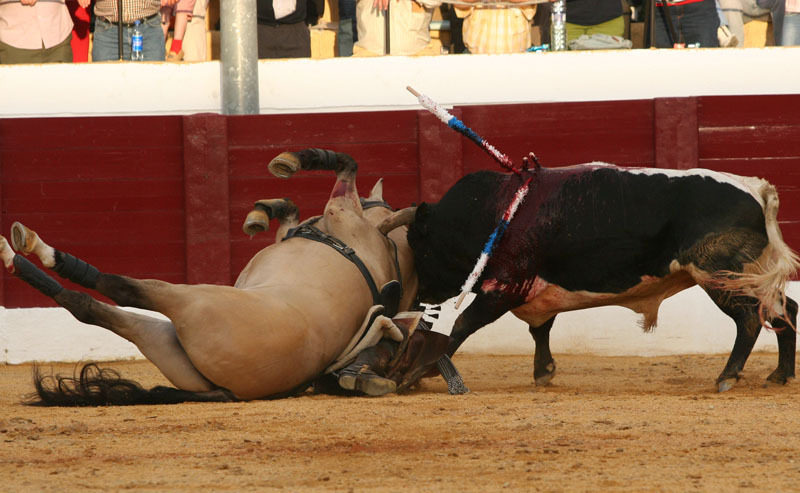 Up to 5 or 6 bulls are massacred in each bullfight, in a torture that lasts 20 minutes. In Portuguese bullfighting, bulls endure the same suffering as in French/Spanish ones, although the bullfighters claim otherwise. The horsemen that perform in Portuguese bullfights torture bulls in private rings to train. They also force the horses to train hard in order to get them obedient and gentle. In the Portuguese bullfights, the bull is brutally expelled from the pen to the bullring where he will face the rider who will stab him with several harpoons ("banderillas"). Due to the intense pain the bull tries without success to chase the rider in order to defend himself, but inevitably the only sufferer will be the horse, even if the horns of the bull are padded. 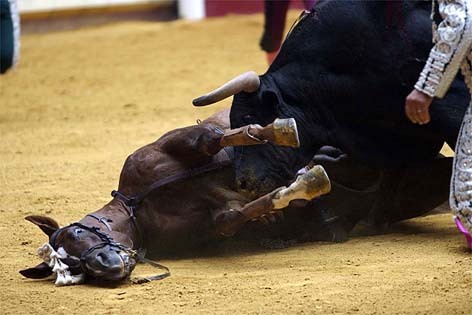 When the bull is exhausted, his body pierced by several banderillas causing extremely pain and torment, 8 men ("forcados") enter in the bullring. 7 of these men assault the bull, grabbing the head, whilst the remaining one grasps the tail eventually immobilizing the weakened animal. The bull is then taken to the pen ("curro") where he will wait in tremendous pain sometimes for up to 2 days until the opening of the slaughterhouse. The banderillas are ripped from his body by force leaving huge holes and wounds. In this style of bullfighting instruments called rejones are used which are stuck into the bulls by rejoneadores (horsemen). Like in other bullfights, they train in private on bulls, torturing them to practise their sadistic skills, before they appear in these performances. The bull is forced into the bullring where he is confronted by these men. The bull is then stuck with many of their harpoons which have a lenght of 5-7cm. The horses are changed several times as they become too frightened to use. Harpoons with a blade of 15 or 25 cm ("rejones") are also stuck into the bull. The torture of the animal continues with the so called "death rejon". This device has a blade of 65 cm and is stuck in the back of the bull. 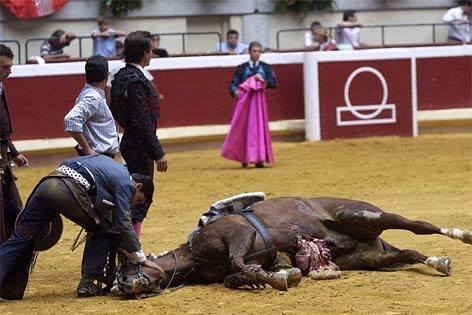 It's common that in these kind of bullfights the horses are deeply wounded by the horns of the bulls in their bellies, loosing their intestines and consequentely die. Young bulls are the victims here. They are fought by inexperienced bullfighters on foot or on horseback. The torture lasts for much longer in these cases before the bull is finally massacred, so that the learners can practise their skills for longer. Before the show the bull is immobilized inside a kind of box where they attach to his horns several ribbons. 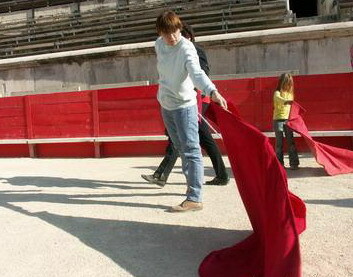 As soon as he is sent to the bullring, men run in front of the animal trying to take the ribbons with a weapon that has a metallic crochet of 16 points. During this show the animal is struck several times with this instrument, causing wounds in the head or in the eyes. These animals need several months to recover after each of these shows before they will be used again. Each cow is put in a metallic box where men attach a rope to her horns, the other end of the rope is outside the box from which the animal will be expelled brutally. In the ring 2 or 3 men pull the cow by her horns. From behind a wooden barricade, a man pulls the rope causing violent pain to the cow by banging her head against the barricade. They also use a spear to force the cow to the middle of the ring. The animal's head is always controlled by the rope. Groups composed of bullfighters, horsemen, etc, move from one place to another with portable bullrings. Around 8 small bulls or cows of Camargue (very young ones, most of them very thin) are transported in a truck which is used as a pen during the performance. The bulls are guided within the small space of the truck by use of a kind of trident. When the door of the truck is opened and one animal is expelled to the bullring, his main reaction is fear as he tries in vain to find an exit and repeatedly tries to jump the barricade. 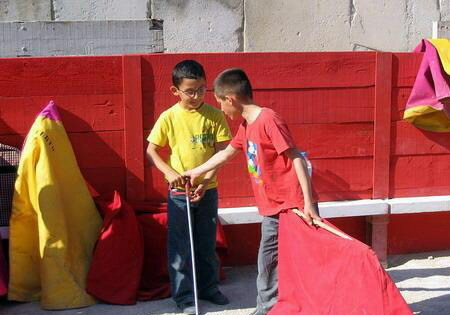 After being provoked with a kind of cape, the bullfighter sticks several banderillas in his body. Due to his intense pain the animal tries in vain to get rid of the banderillas, causing even more pain. Then he is returned to the truck where the banderillas are pulled out by force. In the bullring besides the bullfighters on foot there are also horsemen. They ride horses that have a sort of protective padding, chasing the bull and piercing his flesh with several banderillas. The horses receive the defensive strikes of the bulls. Generally the horns of the bulls are padded, nevertheless this causes traumatic internal injuries to the horses. 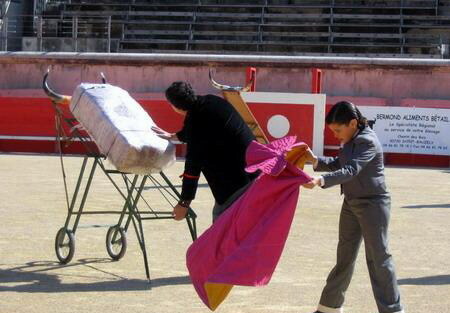 The ferrades are very cruel practises used by the breeders and scandalously promoted in shows targeted at tourists. They consist in marking the young bulls with a searing hot iron. The animal is grabbed and dragged to the ground by several men in order to mark his skin with this iron, which causes intense pain since the skin of the bull is burned like in a barbecue. The "abrivado" consists of running young bulls or cows in the streets, persued by crowds of people. They are also guided by horsemen that have spears who stick them during the shows in order to injure them and to make them fall. The "encierros" are also a kind of running of bulls where they are persecuted by several persons who kick them, twist their tails, throw projetiles, etc. The animals try to escape, but invariably hurt themselves and fall. Generally there are several accidents and sometimes people are killed. Here hypocrisy is the rule. There is no blood but the bulls and cows are toys for "entertainment". The same animals are used several times in these shows. The young terrified calves are chased by the group that attack them, twisting their heads and tails to make them fall, exploding fireworks to terrify them, kicking and striking them and forcing them to walk on two legs, in spite of all the pain caused. During these shows the public are invited to the bullring where men, excited by the preceding events, violently attack them. Sometimes to entertain the youth, a little cow is put in the bullring. The children, after seeing adults molesting the animals, do the same. (The explanations given on this page about bullfighting in France were loosely translated from the book "Le Grand Bluff Tauromachique" by Andree Valadier).